Polymeric Sand Market size will likely exceed USD 85 million by 2025; according to a new research report by Global Market Insights, Inc. Initiatives taken by governments of developing nations to reduce investment gaps in infrastructure sector along with increasing demand for premium homes round the world are the main factors contributing towards the polymeric sand market growth. According to European Investment Bank (EIB), European Union alone requires around USD 180 billion every year for development of transport and logistics infrastructures including roads, rails, airports etc. For the completion of Trans European Transport Network (TEN-T) the transportation sector requires around USD 620 billion by 2020. All these trends will catapult the market demand as it finds extensive usage in joining various pavers used in such mass transit projects. The product’s ability to withstand harsh weather conditions, resist erosion & weed growth, and increasing durability of pavements makes it suitable for such applications. The product has not gained much popularity in the developing nations due to several factors such as lack of awareness, and their dependability on other substitutes such as cement, concrete, and other low cast sands. These factors may restrain the global polymeric sand market growth over the coming years. Polymeric dust segment will witness a higher growth rate at close to 8.5% CAGR as these are majorly used in joining irregular stones or pavers with joints larger and wider than 5 centimeters or 2 inches. Walkways in commercial and residential sector mainly use such irregular flagstones for aesthetic purpose and with increasing number of commercial & business parks, hotels, and shopping complexes, the polymeric sand demand will spur in near future. Based on application polymeric sand market is categorized into pavement and auxiliary spaces, patios, parking spaces, pool deck, and others. Patios segment shows a significant growth rate of around 8% from 2019 to 2025. This growth is attributed to rising demand for luxury homes with better amenities and outdoor living spaces in the developing countries. On the basis of end-use, polymeric sand market is categorized into commercial, residential, industrial and municipal. The municipal segment will hold around 40% share in the overall market by the end of 2025. This segment includes footpaths, sidewalks and all other public infrastructures developed by local or federal governments. The product demand for this segment will increase due to rising government spending in public works and welfare departments. 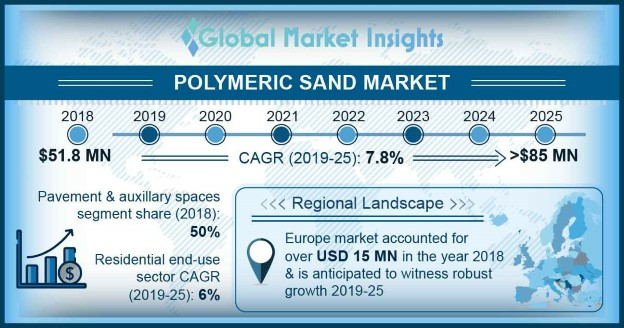 On the basis of region, North America polymeric sand market will be worth over USD 25 million in 2025, showing a significant growth over forecast time period. This is due to presence of a large number of households with outdoor living spaces in region, primarily in the U.S. The prominent players operating in global polymeric sand market are Techniseal, Alliance Designer Products Inc, Silpro, TCC Materials, Sale Marco, Fairmount Santrol, Promasonry, Ash Grove Packaging, Sakrete Inc., SEK Surebond, etc.